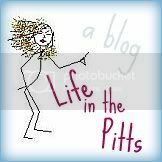 Life in the Pitts: The Day The Romance Died. "You know when you have to poop so bad, your whole body feels cold and shivery?" I turned and stared, a horrified denial stuck in my throat. "No? Well, that's why I'm shivering. As soon as we get there, I need to find a bathroom. Or things are going to get explosive." And that last spark of magic withered and died. Ha, just wait until you're pregnant :-) Then the romance REALLY dies. All bodily functions are open game. It's seriously disturbing. i read this the first time last night --er, this morning-- at nearly 2am after getting home from swing dancing.... my falling-asleep-sister wondered what the hey was making me crack up so bad. so i spread the love. read it to her. i could hardly catch my breath. Not only is it funny, but the way you worded it is funnier.